Chechen President Ramzan Kadyrov has overseen “an administration involved in disappearances and extrajudicial killings,” Treasury Department officials said. 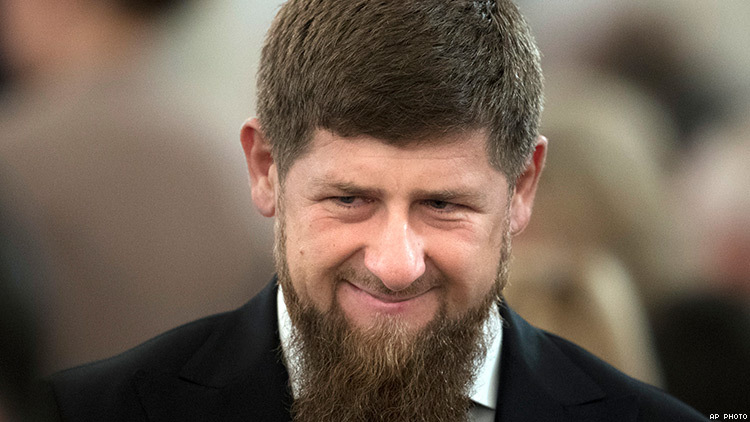 The U.S. Treasury Department is sanctioning Chechen President Ramzan Kadyrov over human rights abuses, including the purge of gay and bisexual men in Chechnya. Kadyrov stands accused of overseeing “an administration involved in disappearances and extrajudicial killings,” Treasury officials announced today, according to Reuters. He and Ayub Katayev, a Chechen law enforcement officer, were sanctioned for “gross violations of internationally recognized human rights,” notes another report, from Radio Free Europe. The sanctions include freezing of bank accounts and travel restrictions. Reports emerged in the early spring that Chechen authorities were arresting gay and bisexual men, many of whom were identified through social media sites and apps, and placing them in camps where they were tortured. According to media in the region, more than two dozen have been killed. Some have been released to their families, with the families advised to kill gay or bi members. Some have escaped to other countries after their release. Chechnya is a semiautonomous republic within Russia, and Kadyrov is an ally of Russian President Vladimir Putin. Putin at first discounted reports of the persecution of gay Chechens, but he eventually agreed to investigate. Kadyrov has denied that Chechnya even has any LGBT citizens, or, as he calls them, “devils.” Kadyrov, reelected as president in 2016, said last month that he was ready to step down and wanted the Russian government to choose his successor. Nikki Haley, the U.S. ambassador to the United Nations, has condemned the antigay persecution in Chechnya, as has the U.S. State Department, but Donald Trump has said nothing about the situation. The U.S. has also reportedly denied visas to gay and bi Chechens attempting to flee. The Treasury sanctions are the strongest action against Chechnya to date. The sanctions come under a U.S. law known as the Magnitsky Act, passed in 2012 and named for Sergei Magnitsky, a Russian whistleblower who died in a Moscow prison in 2009, having been arrested after he exposed a tax fraud scheme. He had reportedly been tortured and denied medical care while in prison, something Russian officials deny. The Treasury Department also announced sanctions today against three Russians allegedly involved in the scheme. A total of 49 people are now on the public sanctions list, and it is likely that more are on a classified list, Radio Free Europe reports. “We will continue to use the Magnitsky Act to aggressively target gross violators of human rights in Russia, including individuals responsible for extrajudicial killings, torture, and other despicable acts,” John Smith, director of the Treasury Department’s Office of Foreign Asset Control, said in a statement today. The sanctions take effect after publication in the Federal Register Thursday. Human rights activists praised the sanctioning of Kadyrov and Katayev but called for further action.